Yesterday I got some good news. 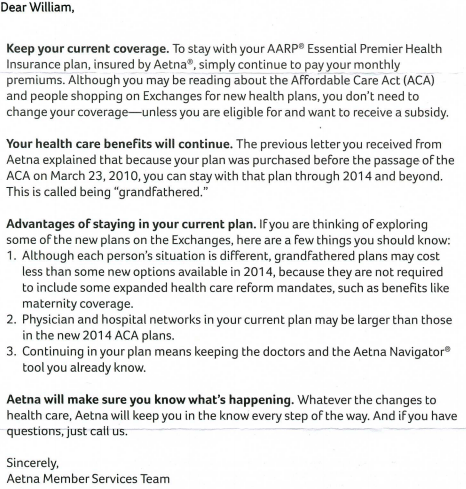 Aetna confirmed that I could continue to keep my grandfathered health insurance plan in 2014. Here is the letter. It is kind of sad but all of the chaos surrounding health insurance cancellations heightened my fears. Despite the President making that conservative argument that if I like my insurance plan I could keep it, it became very important that I figure out what factors allowed me to keep my insurance plan beyond 2013. My trust that the President said what he meant and meant what he said is about zilch. I think the key factor can be found in the second paragraph. I had purchased my plan before March 23, 2010. Coincidentally I received an email from www.ehealthinsurance.com that covered some of the factors that kept some people from keeping their insurance plans. Here is what they said. Once again the key factor appears to be when you purchased the plan. Effective January 1, 2014, your current AARP® Essential Premier Health Insurance Plan, insured by Aetna will no longer be available. As a result of the many health coverage options and policies available under the Affordable Care Act (ACA), AARP will not be co-branding a 50-64 health insurance product in the 2014 Exchange marketplace. Because your current co-branded plan was purchased after the passage of the ACA on March 23, 2010, it does not meet all the new standards required in 2014. As a result, you will need to select another plan with an effective date no later than January 1, 2014. You should have received more details from Aetna, including information about a December 1, 2013 option for an Aetna Individual Plan. If you do not make a new plan selection by November 25, 2013, Aetna will automatically move you to an Affordable Care Act (ACA) qualified health plan (where available) so you have continuous coverage. You must continue to pay premiums on your current coverage through December 31, 2013. This change will go into effect on January 1, 2014. Please note: There aren’t any Aetna 2014 ACA options available in Missouri and South Carolina. There is only an Aetna December 1, 2013 option. For more information, please visit http://HealthInsurance.Aetna.com. Should you need help with enrollment, you can call Aetna directly at 888-352-1047, Monday ”“ Friday from 8:00 a.m. – 9:30 p.m. ET. are the really saying if a person purchased AARP® Essential Premier Health Insurance Plan after March 23, 2010, their plan is being canceled even though the exact same plan exists for other people in the state. A couple of years ago I purchased my health insurance using eHealthInsurance.com. It was easy to use and it had a large selection of plans available. I think that eHealthInsurance.com is what healthcare.gov and the state exchanges aspire to be when they grow up. Now I see that they have seen the future and are comfortable with letting the professionals do the work. The federal government has signed a landmark deal setting the stage for leading online insurance exchange eHealthInsurance.com to enroll potentially millions of people on new Obamacare marketplaces being operated by the government, it was revealed Wednesday in a filing with Securities and Exchange Commission. We can see that most of the plans are less than $1,000 per month with the lowest cost plan, $184.70, being the most attractive to a healthy young man. 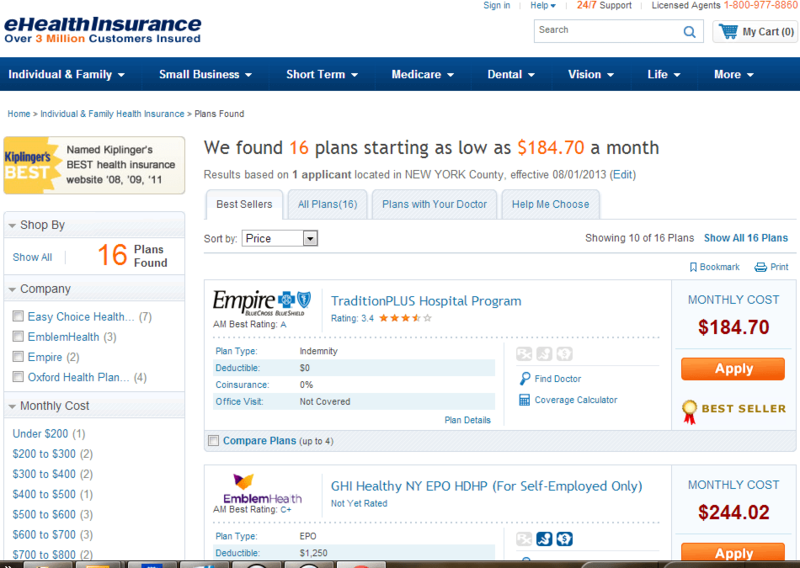 In the ehealthinsurance.com November 2012 report, The Cost and Benefits of Individual & Family Health Insurance Plans, they said that the average cost for an individual policy in the state of New York was $357 per month. It is disappointing that only sixteen plans are offered. If I enter the same data but use a location in Ohio(Clermont county, zip code 45122) we see that he could get health insurance for a low price of $42.60 per month and have over 77 different plans to choose from. In fact 75 of those plans have a monthly premium that is less than $200. So I am confronted with a couple of problems with the New York Times report. What is the actual price for health insurance for a healthy individual in 2013? Is it the $1,000 per month as reported by the New York Times or is it closer to the prices quoted at eHealthInsurance.com? If it is closer to the rates available on eHealthInsurance.com then the rates are likely to go up in 2014. Assuming that New Yorkers have not discovered a cure for cancer or obesity in 2013, why are the insurance premiums going down in 2014? Is this a bet that the amount of medical care that is not covered by health insurance, Medicaid, or Medicare will go down dramatically in 2014 or an admission that New York City health insurance numbers are “funny” numbers? When you look at insurance rates in other states a 50% drop in insurance premiums for New York screams that someone is using “funny” numbers. Are we to believe that some of the most incredibly savvy business men and women in the country really paying over $1,000 a month for health insurance when they could be paying less than $700? If these guys and gals are really that savvy, why can’t they get a rate like they have in Ohio? With the obvious problems that an unexplained 50% drop in insurance premiums bring to the table, you would think the New York Times would not want to bring more attention to the fact that the idiosyncrasies of the New York insurance market are not duplicated elsewhere. In this case I would have thought it would be better to be thought a fool than to open your mouth and remove all doubt. Austin Frakt wrote a post, “On what do health economists agree?”, that got me thinking about what most people agree about the Affordable Care Act. John Goodman beat me to the punch with his post, “I Edit Austin Frakt’s List”, but it still spoke generically about health care reform and not specifically about the Affordable Care Act. Health care reform is nice but the Affordable Care Act is law. So here’s my take on the provisions of the Affordable Care Act that both sides agree upon. The employer mandate is a bad policy that was poorly implemented. Are there any conservatives arguing with Ezra Klein’s claim that the employer mandate shouldn’t be delayed, it should be repealed? The individual mandate is a bad policy that was poorly implemented. The individual mandate is bad on so many levels it is hard to find someone willing to defend any part of it. Even its supporters are skeptical that it will work. So why do we continue with the charade? The success of the individual mandate hinges on convincing young, healthy people to buy health insurance they did not want when it cost half as much. If that wasn’t bad enough the IRS was chosen to enforce the law. This is a lethal political concoction. It is no surprise that poll after poll says the people hate the Individual Mandate. Undoubtedly the Affordable Care Act supporters would have a much easier time drumming up support for the rest of the law if the individual mandate would quietly disappear. The cost for a bronze level health insurance plan is a lot closer the eHealthinsurance.com’s price than it is the price paid by large group plans. This revelation occurred when California posted the proposed prices for health insurance prices available on its health exchange. Kaiser Health News promptly changed their insurance cost estimator and the Roofer’s union had a panic attack. If an employer was paying $15,022 for a family policy that your employee can get for $5,000 on the health exchange, what do you think an employer is likely to do? The Roofers have seen the future and they don’t like it. For states with high health insurance costs like Massachusetts, you have a problem! Most people’s health insurance plans were better before the Affordable Care Act. Today I heard Juan Williams complain on a Sunday morning talk show that Republicans did not have an alternative to the Affordable Care Act. Since most people are healthy and have health insurance, the Affordable Care Act has done little for them except increased their costs and anxiety. Sorry, Juan, my old plan was just fine and I would like to keep it just the way it was. The same goes for the Roofer’s union. The Affordable Care Act is merely a shell game with the health care funds for the people who are uninsured and chronically sick. All of this effort for a minimal decrease in the number of people without health insurance. Since most people are healthy they do not see a reform. Their only contact with health insurance reform is through how much they are paying for insurance and it continues to go up at the same pace. Maybe we should start treating the chronically and critically sick who do not have insurance as a health care spending problem rather than a problem that can be solved with more health insurance revenue. Businesses want out of the health insurance business. When I started working in 1976 health insurance was an affordable employee benefit. For the employee it was so cheap you did not think about it. For the employer it was so cheap and simple to manage, they did not think about it either. In forty years it has gotten severely out of control. It has gotten so expensive that it poses a real risk to the business. It is not surprising that when small businesses feel threatened with health insurance risk they are resorting to their dropping health insurance plans or going to defined contribution plans. All health care is local health care. The optimum health care plan involves your local doctor and hospital. How a federal plan, the Affordable Care Act, became the best option to accomplish this local health care goal confuses me. Like federal education programs it does seem to be the wrong tool for a local problem. There are alternatives. Here is an article by Sarah Kliff, Is this the end of health insurers?, describing a growing trend of health insurance being offered by local hospitals. Health care cost accounting matters. It is hard to see an improvement in health care occurring without a tremendous improvement in cost accounting. Stephen pointed out the problem in his article, “ Bitter Pill: Why Medical Bills Are Killing Us”. From the Wonkblog we get this bit of good news about Obamacare. In 2009, the Congressional Budget Office predicted that a medium-level “silver” plan ”” which covers 70 percent of a beneficiary’s expected health costs ”” on the California health exchange would cost $5,200 annually. More recently, a report from the consulting firm Milliman predicted it would carry a $450 monthly premium. Yesterday, we got the real numbers. And they’re lower than anyone thought. As always, Sarah Kliff has the details. The California exchange will have 13 insurance options, and the heavy competition appears to be driving down prices. The most affordable silver-level plan is charging $276-a-month. The second-most affordable plan is charging $294. And all this is before subsidies. Someone making twice the poverty line, say, will only pay $104-a-month. I checked my eHealthInsurance.com report for average health insurance premiums by state and the California number seems reasonable. Back in December I wrote the post, What if Individual Health Insurance Premiums do not go up as fast as expected, in which I speculated that lower than expected individual insurance premiums might be a likely result. It was based primarily on the fact that my health insurance premium was lower before Obamacare and doing nothing is a likely political compromise to avoid premium cost shock. For a large portion of the population the less we implement of Obamacare the better off we are. This was recently confirmed in a recent Fox News poll. So now I find myself in the odd position of rooting for increased incompetence in implementing Obamacare. Murphy rules and Obamacare supporters drool! This month I wrote the post, Has Obamacare Started to Channel Jerry Macguire, when I noticed a pretty dramatic shift in health insurance premium estimates by the Kaiser’s Subsidy Calculator. I am still not sure why Kaiser changed their calculator but it does make Obamacare a lot more attractive to some people. It sure looks like Obamacare supporters have embraced the “Show me the money” mentality. Now we see the Washington Post report is echoing the same individual health insurance premium costs that I found in my previous posts. So if we assume that all of these reports are true then we have a new set of questions to ask. What are large organizations going to do? In my post, Spending for Private Health Insurance in the United States, we can see that according to the NIHCM the price large organizations are paying for health insurance, $15,022, is much worse than the price being paid in the individual insurance market, $4,968. With further confirmation by Kaiser and Milliman I was struck with the thought that somewhere along the way these large organizations are going to start believe that they are getting ripped off and their logical reaction will be to dump their employees into the exchanges. I don’t think the Obamacare supporters saw this one coming but the next logical step for these large organizations is to embrace a defined contribution approach to health care just like the small businesses who are using HRAs. It is time for large organizations to play a much smaller role in the health care for their employees. Zane Benefits has a plan to accomplish that. Isn’t that one of the major goals of health care reform? What are the high health care cost states going to do? According to eHealthInsurance.com the five highest health insurance premium states are Massachusetts, New Jersey, New York, New Hampshire, and Alaska. Their average health insurance premiums are much higher than California’s and Kaiser’s price. So if you are a resident of Massachusetts and your costs are $965 per month maybe it is time to ask your legislators for health care reform that lowers your cost. When your state’s health care costs stick out, it is likely someone in the state is going get hammered. What is the health care industry going to do with the passive-aggressive health care consumer? One of the big differences between the people who are purchasing health insurance in the individual market versus the large group market is that they are savvy about health care prices. These consumers have mostly gotten over the health care hump and learned to shop for health insurance like they shop for auto insurance. It may be a shocker to some but they accomplished this without health care navigators. The large group participants on the other hand have not seen the health care hump let alone gotten over it. I expect they will exhibit a lot of passive-aggressive behavior until they get used shopping for health care in this brave new world. I cannot wait to hear the first reports of harried doctors complaining that their patients are asking them too many questions about costs and alternative treatments they cannot or do not want to answer. Life was so much simpler when no one cared about health care costs! The idea of encouraging an insurance market place for health insurance has been a favorite idea of health care economists. The key idea was to establish an insurance market place as an alternative to the employer based health insurance. As a person who buys health insurance in the individual insurance market, my view of a health exchange is more along the idea of www.ehealthinsurance.com. The Affordable Care Act proponents decided that by combining a few concepts of market based health insurance with a new mandate to distribute insurance subsidies to the poor, they could convince the states to subsidize the exchanges. It was a political gambit that failed to convince states or people like me to participate. The states figured out that if they did nothing, the federal government would pick up the entire bill for setting up and funding the exchanges. This subsidy issue overwhelms and obscures efforts at encouraging an insurance market place with more competition and lower costs. Why should I participate in a health exchanges if they are not offering me lower costs and greater choice like I can get by using www.ehealthinsurance.com? States have to decide by Feb. 15 whether they will create their own health insurance exchanges, partner with the federal government or allow the federal government to do it for them. Meanwhile, during a congressional hearing marked by skepticism, a Health and Human Services official told lawmakers that the government would be ready to enroll people this fall.